I recently found out the beauty of making food and then freezing it. One of my favorites to do this with is chili. I found this recipe called It’s Chili by George!! on All Recipes and modified it to my liking. In a non-stick skillet, brown the ground beef on medium-high heat. This will probably take about 10 minutes. You’ll need to mix it up regularly as it’s cooking. Meanwhile, chop up the onion, bell pepper and celery. Rinse and drain the beans. Toss everything but the meat into a large stock pot. Turn the heat up since it will take a little while to get it boiling. Meat should be done so drain it (you can use the same sive as for the beans) and toss into the stock pot. 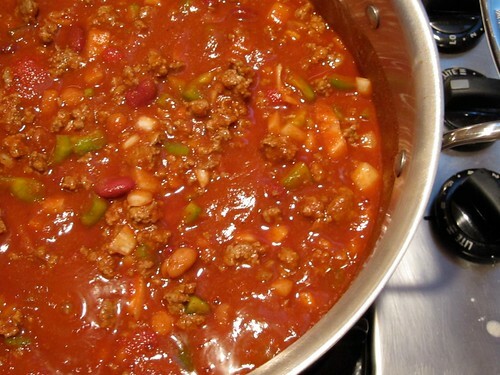 Bring the chili to a boil and then turn down to low to simmer for 1.5 hours. Either serve immediately or put into tupperware and freeze. Will keep for up to a month. *I like to use Knudsen’s tomato juice because it’s a little thicker. Your chilli looks great. I have not made chili in ages. If it was not so hot out I would be making me up a big ol pot too.